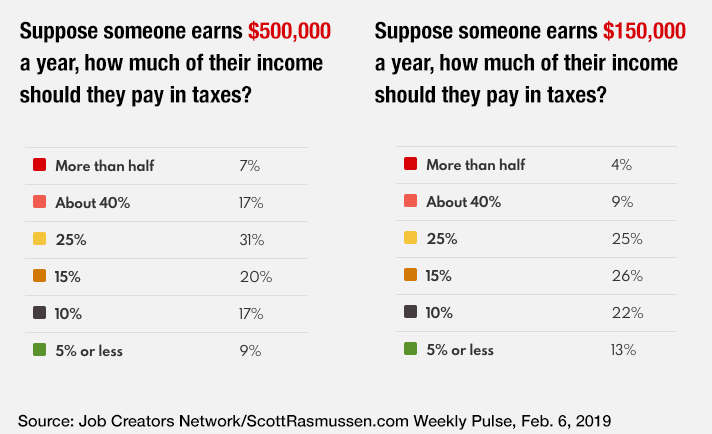 Washington, DC (February 7, 2019) – When asked how much someone should pay in taxes if they made $500,000 a year, only 7 percent thought they should pay more than half in taxes. That number drops to 4 percent when talking about those who make $150,000 a year, according to the Job Creators Network/ScottRasmussen.com Weekly Pulse, released today. In another poll question, only 22 percent of Americans could correctly estimate how much income is needed to be considered part of the “1%” of earners. According to Social Security Administration data, someone needs to make more than $719,000 annually to be in the top 1 percent of American earners. 14 percent of respondents thought you could be in the 1 percent if you made $125,000 a year and 28 percent thought you would have to make $10 million or more. 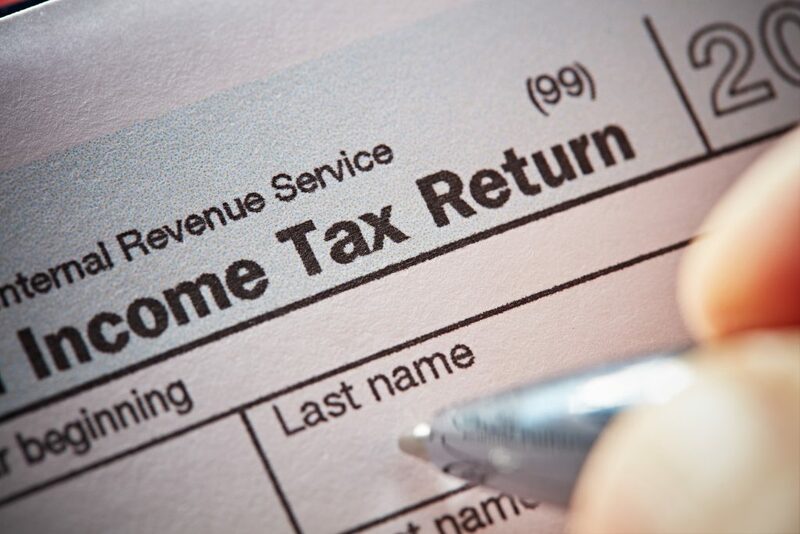 When asked how much of the total federal income tax collected was paid by the “1 percent,” 74 percent incorrectly thought it was 25 percent or less. In reality, the 1 percent paid about 40 percent of all income taxes in 2017. Americans were equally as confused about how much they thought the “1 percent” should pay in taxes. Only 16 percent of people surveyed thought the 1 percent should pay more than half their income in taxes, while a majority (56 percent) thought they should pay a 25 percent tax rate or less. The Weekly Pulse also found that people wanted the “1 percent” to pay more in taxes—but lowered those numbers when asked how much someone who makes $500,000 in income should pay. With so much uncertainty about incomes or fair tax rates, it’s easy for politicians and other public relations specialists to mold public opinion around vague slogans,” said pollster Scott Rasmussen. How would you rate the US economy today? Excellent (11%), Good (39%), Fair (30%), Poor (17%), Not sure (2%). Is the economy getting better or worse? Better (33%), Worse (29%), About the same (31%), Not sure (6%). Okay, how would you rate your own personal finances these days? Excellent (11%), Good (35%), Fair (33%), Poor (18%), Not sure (2%). Are your personal finances getting better or worse? Better (28%), Worse (20%), About the same (50%), Not sure (2%). Are companies in your area more likely to be hiring new workers or laying off existing workers? Hiring new workers (43%), Laying off existing workers (19%), Not sure (38%). This ScottRasmussen.com/HarrisX poll of 1,086 US adults was conducted Feb. 4-5, 2019. For more information about the Job Creators Network, please visit www.JobCreatorsNetwork.com.